A conscript described as a gay soldier by the Thai media would not go quietly after creating trouble in Walking Street this morning. His gay lover joined in after a member of the public tried to help a police captain before the men were overpowered. The rant and trouble continued at Pattaya police station where serious charges were laid against the men. One threatened to shoot the officer. The incident began in Walking Street, South Pattaya, around 4 am when a tourist reported trouble. Pol Capt Sukhachai Thamsuree responded. He was kicked by conscript Jakraphat Khamreuang who resisted arrest. A member of the public came to his aid and this infuriated Jakraphat's gay buddy Phittinan Charoenwong, 31, who joined in the melee. Phittinan hit the police captain in the face. At the station Jakraphat threatened to shoot the police and continued trying to fight as the pair hurled abusive insults, reported Siamchon News. The pair have been detained and charged with drunk and disorderly behavior, resisting arrest, assault on a police officer and slander. Because, he always brings up the rear at every parade? 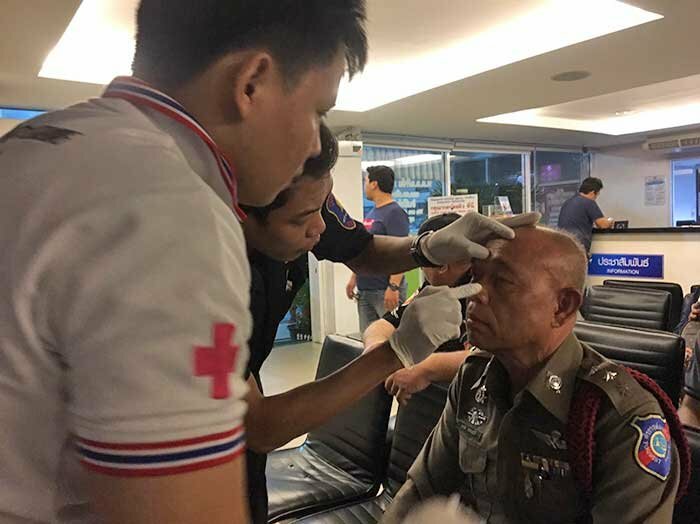 Did the public good samaritan cop a 500baht Fine? They could technically... as he made himself a part of it. yeah,the boyfreind looks like a right hard nut. Nowt that a Taser wouldn't sort out .. Especially the gobby one ..
Made right "<deleted>" of themselves! Where is this incredibly boring universe? Why are violent prisoners left to rant, rave, roam around and threaten in a public waiting area?! Makes you wonder the level of training Thai police receive.